Removable disk drive combines the speed of a hard disk with the portability of optical media for quick, easy, affordable backups with continuous data protection. Dell RD1000 is 100% compatible with all RDX Technology, including HP RDX, Imation RDX and Tandberg RDX. Removable disk drive combines the speed of a hard disk with the portability of optical media for quick, easy, affordable backups with continuous data protection. Dell PowerVault RD1000 removable disk drive lets you quickly protect all your important information and take it with you. Designed as a sensible, affordable alternative to tape and CD/ DVD backup, the PowerVault RD1000 is fast, user-friendly, and reliable. 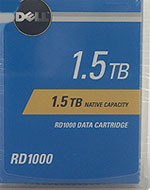 The PowerVault RD1000 is available in capacities up to 1.5TB, and the media cartridge weighs about as much as a cell phone. 114X RD1000 is a rack mounted solution configured with up to four RD1000 USB drives. 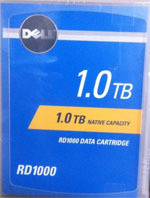 Dell Powervault RD1000 pdf Data Sheet - Click here.